A man with 12-inch knife went on a stabbing rage, shouting "Allahu Akbar" and stabbed three people. 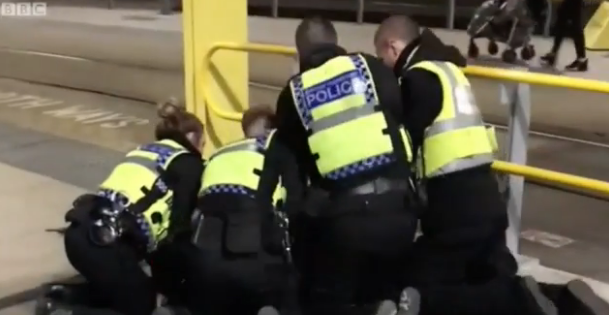 The officers at the British Transport Police(BTP) were reportedly called at 8:52pm to the crime scene, and two people have reportedly been taken to the hospital for knife wounds in their shoulders. What it looked like was a guy in his 60s with a woman of similar age and another guy all dressed in black. It looked like they were having a fight but she was screaming in this blood-curdling way. I saw police in high-vis come towards him. He came towards me. I looked down and saw he had a kitchen knife with a black handle with a good 12-inch blade. It was just fear, pure fear. The woman had injuries to her face and abdomen, and the man had injuries to his abdomen. A BTP Officer was also stabbed in his shoulder, and was later released from hospital. The investigation about the incident is now being led by the counter-terrorism police, and Assistant Chief Constable Rob Pottis have said while the night event might have people worried or stressed, the event is not ongoing, and the suspect is now in custody, and no longer a threat to the society.